Be sure your Green Card (International Insurance Card) has an uncanceled "MK" box, because of the customs formalities. Try to get a good map of the Republic of Macedonia and/or try to be able to read Cyrillic letters. Although most street signs are printed in Cyrillic and Latin letters it can be helpful to have a little knowledge of the Cyrillic alphabet, especially in small towns or villages. If you don't have it's easy for you to find it at almost every gas station. Road signs in some areas are frequent and accurate but they may suddenly be gone altogether. If you run out of gas, the gas stations are all over the interstate on every 5-10 km, with a comfortable restaurant or snack-bar, including a garage (local term-avtomehanichar), to repair you car or your flat tire (local term-vulkanizer). snow chains are vital - winter period (November 15th - March 15th). During a routine police check you may have to show that you do indeed have all that. Fines can be 300 EUR or much higher. First-hand and second-hand spare parts for German-made cars are widely available. For other cars, second-hand spare parts may be a little more difficult to find. 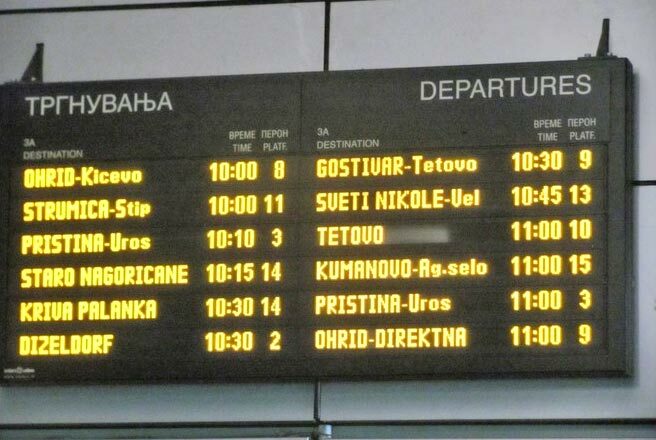 There are bus connections from Serbia, Kosovo, Bulgaria, Slovenia, Croatia, Germany and Turkey to Skopje, Tetovo, Gostivar, Struga, Ohrid. Skopje is connected to the countryside with a buses on every 1-2 hours to almost every city in the Republic. However, there might be only one bus daily to the smaller ones. It is strongly reccommended for the foreigners to use the bus services, so they cannot be cheated over prices. Buses are cheap, clean and safe.